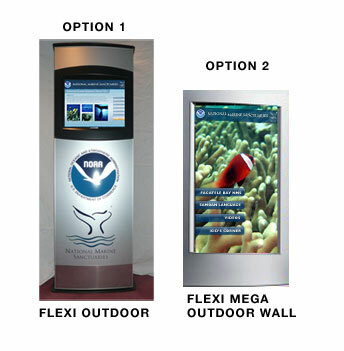 This Web site is a collaborative working site of the core team for the National Marine Sanctuary Interactive Touch Screen Kiosk Program. The kiosks offer a high-impact visual and auditory showcase of all the treasures the sanctuary has to offer. With the click of a button, users learn about the various activities of the sanctuary; educational and outreach programs, research projects and resource protection programs as well as extensive information about species and habitats. Each kiosk offers real-time weather information from the National Weather Service, site specific as well as National Program information. It is also tailored to include information about institutions that partner with the sanctuaries.The kiosks meet Section 508 and ADA guidelines. 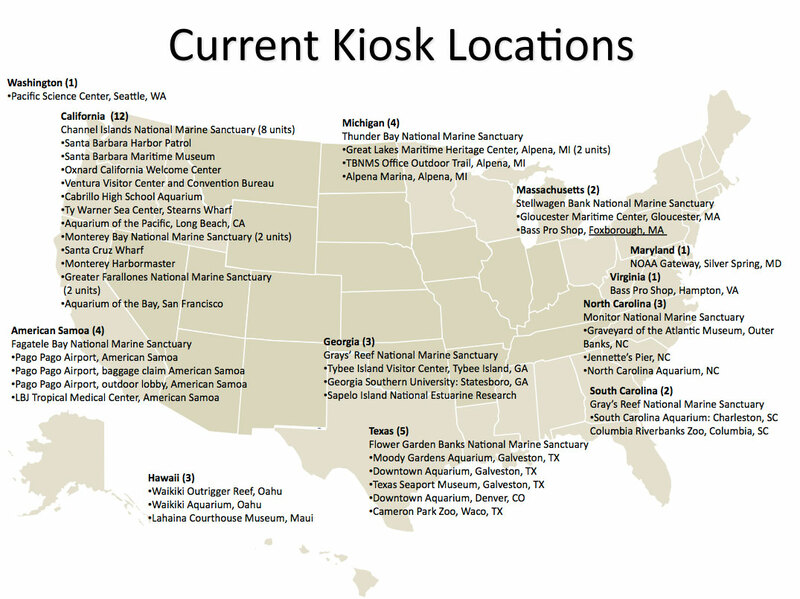 The National Marine Sanctuary Program’s user interface is one of the most in-depth and content rich kiosks anywhere. Maintaining the program’s commitment to outreach and education, the kiosk serves as an interactive collection of knowledge and information. Information is available about all the sanctuaries with a video-based “Visual Journey” of the different sites. Because each sanctuary has its own unique makeup of attractions and marine life, much of the kiosk’s content is specific to its location. For example, there are nearly 200 documented shipwrecks in the waters of the Channel Islands National Marine Sanctuary (CINMS), therefore there is a section of the interface where users can read about and watch video explorations of several underwater expeditions. In-depth information of the sanctuary’s unique marine life and environment is available to educate users on the area’s ecological makeup. Sanctuary visitors can view interactive maps of the area, nautical charts or even see 3D animations of the ocean floor. The interface includes an entire section just for children called “Kids Corner” where children can see and learn about aquatic life in a fun and entertaining way. Several Flash games give children a fun activity but also teach important messages central to the NMS program. The Kids Corner has quickly become one of the most popular sections of the kiosk. Local sailors and fishermen can use the kiosk for up-to-the-minute reports on weather and ocean conditions. In addition, the weather section provides reports on various weather related topics. Forecasts, wind models, satellite and radar images, tide and current conditions and even data streamed from weather buoys are all available though links to various web services. The kiosks software maintains the ability to lock down the web interface when information is streamed from a web source (such as the National Weather Service) the user only sees the specific map, forecast or radar image for their area and can not use the kiosk to browse the web. This ensures that the kiosk cannot be accidentally or intentionally compromised. Although similar in its interface with the users, kiosks are intrinsically different from websites, requiring specialized programming tools. Setting up a system of kiosks at a sanctuary location requires management of the content and design process, coordination with the kiosk team and the various sanctuary partners. In addition, graphic materials need optimizing, photos and other elements need editing and formatting to fit the kiosks specific requirements. Because each kiosk is monitored remotely 24/7, 24 hour high-speed internet access is required for all units. The Technical Team is responsible for all aspects of planning and implementing the Sanctuary Interactive Kiosks. The team coordinates with other NOAA agencies, sub-contractors and the various local partners in the development of the sanctuary-specific kiosk. This team is designated on a project basis. Each sanctuary site has provided content creation and collaboration along with various partners to work with the technical team. Content on this site are only examples of the Interactive Kiosk Program’s content. These are primarily preliminary materials, and these illustrations are intended as informational material.